stone, brick, or paver] surface. 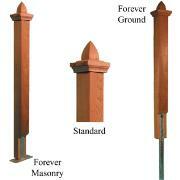 Posts come in many sizes, solid or hollow and can be direct buried in the ground or using the Forever Post system set it in concrete or bolted on a wall. BrattleWorks’ Posts are constructed of clear kiln dried western red cedar available natural or with 100% acrylic white, green or any custom color stain.